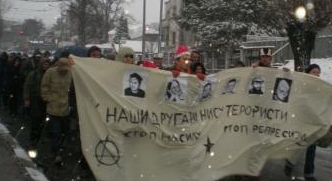 A demo in solidarity with the Belgrade Six. Over 100 people protested today in Belgrade to demand the release of the six prisoners. The demonstration went from the Ministry of “Justice” to the prison where the people are being held. They have been in custody for four months now. People carried signs with slogans such as “Our friends are not terrorists” and “obstructionist injustice”. The Belgrade Six are awaiting trial with outlandish charges are "international terrorism" in connection with minor vandalism which occured several months ago at the Greek Embassy.